The best results will be achieved by dedicated teams baiting in a coordinated fashion across an entire infestation. This cannot always be achieved, especially in residential areas, due to differing opinions and priorities amongst landowners, difficulties in accessing all properties, and simple resourcing constraints. However, as much as possible, the baiting programme described here should attempt to treat as large an area of infestation as possible and try to have that area bounded by containable edges, such as roads. Baiting just one residential section will deliver a temporary reprieve, but reinvasion from neighbouring untreated areas can occur quite quickly, and leave people feeling disappointed with the outcome. One of the keys to success is that bait is applied over the whole treated area in the same day, or if multiple days are required, then baiting should proceed in a step-wise fashion across the area, pausing between days at the edges of roads, waterways, or other pre-existing barriers to ant movement. Argentine ant nests are quite mobile, and piecemeal treatments can cause disturbance to colonies getting sublethal doses and trigger budding-off or movement of colonies to new locations. If attempting to treat an entire infestation, with the possibility of eradication in mind, then an initial part of the plan is to conduct a delimiting survey to determine the extent of the infestation. This is best done by direct searching if the searchers are competent at identifying Argentine ants in the field, or by conducting surveys with baits when subsequent laboratory confirmation of presence is required. When the full extent of the infestation is determined, a baiting plan can be prepared and the numbers of people and bait needed calculated. You should also plan to bait a buffer zone of at least 20 m wide around the entire infestation (except when there is a substantial natural barrier, such as a lake, on one edge). Take into account that it is much quicker to bait flat urban areas, approximately 4–5 person hours per hectare, than to bait steep hillsides with denser vegetation, e.g. 18 person hours per hectare. In urban areas, some of the land area is occupied by buildings, and these are not baited internally. Likewise, there is little to be gained from baiting large expanses of unbroken concrete or tarmac. To date, the bait usually adopted for extensive baiting campaigns is Xstinguish™ Argentine ant bait, containing 0.01% fipronil. This bait was developed specifically with wide-area control in mind, and contains both protein and carbohydrate attractants. The protein component assures rapid transfer to queens and larvae, and this is essential to the success of this bait, as it is relatively fast acting in comparison with some of the other baits on the market. One significant drawback of this bait is that it has a relatively short field-life, so it is important that there is good ant activity on the baits very soon after application. However, the bait life can be extended by sheltering it from the sun beneath vegetation, under loose debris, in cracks in the ground, or even in bait stations consisting of short lengths of plastic hose pipe. In usual circumstances, you should allow a minimum of 3 kg/ha of Xstinguish™ bait in typical flat urban/residential circumstances, but plan to double this where it is hilly (increasing surface area), amongst denser vegetation, or where there are extensive barked gardens. Earlier advice was that the best time to bait was in mid-summer when worker activity was at its highest. The theory behind this was to ensure excellent uptake of bait, and it is a method that has been used successfully in a number of operations. However, recent trial work (Toft 2011) has shown that excellent and prolonged control is obtained by baiting in spring when Argentine ants are just starting to move from their winter aggregation sites. The coming season’s new queens are all produced as young larvae at this time, so a baiting operation that targets the developing brood in spring is likely to have a severe impact on the ants' reproductive capacity over the late summer. There is excellent uptake of protein-based baits in early October, and the level of reduction in ant populations easily matched that of summer baiting programmes, but with the added benefit that ant populations did not reach peak summer activity levels before bait was applied. It would not be advisable to bait in early spring if temperatures are very low (e.g. during a southerly front), in which case foraging activity will be low, but there will be excellent activity at baits whenever daytime temperatures are above 15°C, especially on sunny days when ants and surfaces are warmed by direct solar radiation. If you choose to bait in midsummer, try to avoid having fresh bait out in the middle of very hot sunny days, as the bait dries out faster and ant activity will be reduced when substrate temperatures get very hot. Argentine ants forage actively night and day whenever it is above 15°C, so there is no harm in waiting until later in the afternoon to lay baits during very warm weather. If rain is forecast, baiting should be delayed until the next fine period. However, drought conditions also have a significant detrimental effect on foraging activity, so baiting should also be avoided after a prolonged period without any rain. Lay the bait across the treatment area in a 2 × 2 m grid. If you have multiple people baiting, line them up about 2 m apart and then move forward systematically to ensure good coverage. Some areas of especially dense ant activity or with a highly structured substrate (e.g. bark gardens) should have the grid reduced to 1.5-m or even -m spacings. Each bait should be about 1–1.5 g (about the size of your small fingernail). As mentioned above, the field life of the bait can be extended by sheltering it where you can. For example, if baiting on a lawn, deliver it under the grass leaves or under a broadleaf weed. Small pieces of bark or fallen tree leaves can be placed over the bait. A good place to bait is down the gap at the edge of a concrete path or kerbing where it abuts a lawn. Where there are no natural shelters, small sections of garden hose pipe can be used as bait stations. Think in three dimensions when baiting around rock walls, banks, or where you see ants trailing up trees. Some bait delivered in tree bark crevices or in the fork between branches can help get the bait delivered back to colonies that may not be foraging on the ground at that time. Fipronil (and other insecticides) are potent ecotoxins, particularly for aquatic organisms. For this reason you should not lay baits in drains, gutters or within 3 m of any waterways. It is often useful to assess the success of baiting operations. You can use either the baited tiles method or baited vials method, but ensure your methods and numbers of tiles/pottles remain the same before and after treatment. Conduct one survey shortly before the day of toxic baiting, and repeat it a week or two later. A successful control campaign will be aiming for a very significant reduction in population of 90% or more, so the differences in counts you are looking for are major, so don’t worry about being too precise when you are facing a pottle or photograph with hundreds of ants in it. Another advantage of monitoring in this way is that it can help identify potential hotspots of activity and guide you towards areas needing some form of mop-up treatment. 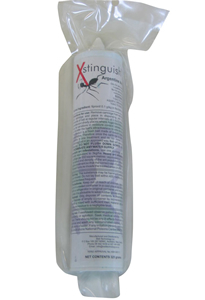 Current best practice is that Xstinguish™ baiting should be repeated after 6–8 weeks to treat any surviving ants, but this should be taken as a guideline only. Following a very successful baiting operation over an entire infestation, ant numbers can remain very low for the remainder of the season and it can be difficult to attract any onto baits. In these situations, baiting the entire area again may be a waste of resources, and there is little empirical evidence supporting this approach. Certainly if there are hotspots of activity apparent after 6–8 weeks and you can attract them to simple protein baits like canned salmon, it may be worth baiting that area again as well as a buffer zone around it. In other situations the ants will only be apparent by searching and if you can locate a small area of activity you should also consider other approaches, such as granular ground treatments or residual surface sprays. These techniques can also be used to provide some border protection in situations where there are unbaited areas adjacent to baited ones. In these situations we recommend that the border protection is applied at least a week after baiting. The reason for this is that the application of residual contact insecticides is likely to cause significant colony disruption around the edges of the treated area, and this is likely to have a negative effect on bait uptake. In situations where residents do not want residual insecticides applied to their properties, a regular schedule of baiting around the boundaries may provide ongoing protection. The use of longer lasting carbohydrate-based baits in stations may also be useful in these situations, but needs to be tested in a proper field context.